Santa Clara University Entrusts Riverview Systems Group With School-Wide Systems Integration And Live Event Support | Riverview Systems Group, Inc.
Nearly thirty years ago Riverview Systems Group (Riverview) began providing a mix of systems integration and live event support services to Santa Clara University (SCU), the Jesuit University in Silicon Valley, a relationship that continues to this day. Now many university faculty members have integrated technology to enhance teaching and learning, incorporating active learning methodologies in the classroom. According to a 2015 report released by IDC Government Insights, technology investment in the United States is at all-time highs with higher education institutions spending $6.6 billion, and California leading the way with approximately $2.3 billion in 2015. Riverview started working with the University in 1989 providing audio-visual services for its commencement ceremonies. Over the years as technology has continued to evolve at an almost frenetic pace and institutions of higher learning continue to innovate in how they educate the students, Riverview has become a steady, trusted and strategic campus-wide systems integration resource. The company works closely with the Academic Technology Department providing state-of-the-art AV technology that has touched nearly every area of the campus — from the historic Mission Santa Clara de Asis, to outfitting numerous classrooms, conference and meeting rooms, large facilities such as its prestigious Harrington Learning Commons, Sobrato Technology Center and Orradre Library, performance spaces, sports venues and the business school. From the very start, Riverview worked closely with Nancy Cutler, Santa Clara University’s Deputy CIO for Academic Technology and Co-Director, Collaborative for Faculty Innovation, to support university-wide technology initiatives and a wide range of campus technology resources and services, including academic technology initiatives, learning space development, computing and technology support, media production, graphics, web application development, technology training and the campus cable TV system. Cutler also notes that working with Riverview has been key to converting the entire campus media systems from analog to digital while maintaining upgrade cycles that keep their spaces compatible with current technologies – all of which has been critical to their instructional spaces and its support of an ever-growing range of teaching and learning activities. As for the most challenging projects where Riverview’s experience and talent shone particularly bright and exceeded the university’s vision, Cutler points to the Harrington Learning Commons in 2008; the Paul Locatelli Student Activity Center in 2011; Graham Commons in 2012; Guadalupe Hall in 2015; and Alameda Hall in 2016. Todd Vrzal and Steve Soto, Riverview’s longstanding System Integration Directors, oversee the day-to-day SCU technology integration and on-site technical support. The cornerstone of Riverview’s systems integration work at SCU is most clearly demonstrated in the Learning Commons. The four-story, nearly 200,000 square foot, 47 room building, the SCU Library, which features 26, six and eight-person collaborative rooms, was updated in two phases. Riverview provided services first in 2008 involving the integration of some 68 high-end computers, media stations, assistive technology stations and reference materials; a digital media lab and faculty development lab; video conferencing rooms; three training rooms for library and technology instruction that double as drop-in labs when free; and two video editing suites. The 2008 installation included 57” NEC flat-panel LCD screens, Panasonic projectors and multiple video and computer sources allowing students to share files and work on projects. In the St. Clare Room, the signature reading room and event space, Riverview installed the then cutting-edge Panasonic 1080p large venue projector in an application where projector and screen are completely hidden until a touchscreen lowers them (as if in a James Bond film) — complete with inputs for connecting Blu-ray players, computers and even linking other classrooms. 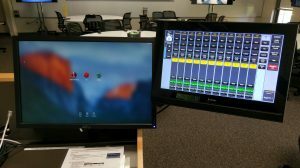 The AMX touchscreen allowed presenters to control everything from lighting to the wall-mounted cameras, while web streaming capabilities (based on MPEG-4 encoding) let students watch classroom activity in real-time or stream it at their convenience. In 2013, following an eight-month SCU data gathering process that included student focus-groups and a student survey in which over 2,300 responses were received, the university decided to consolidate and relocate service points, and Riverview was brought in to handle the massive tech upgrade the project represented. “We replaced all of the control systems, the monitors in many of the collaborative spaces and made some of the taping rooms (rooms where students can watch required viewing material or easily record themselves and copy onto a USB drive for later viewing) more user-friendly,” Soto says. Then again, in 2016, Riverview upgraded the existing projection in the St. Clare Room to a Panasonic PT-RZ970 10,000 lumen HD laser projector. They also outfitted the room with 60 state-of-the-art Televic microphone systems so everyone can be heard easily eliminating the potential for feedback while keeping the overall sound low in the room for confidential gatherings. Riverview’s systems integration work on the SCU Library was awarded the Pro AV Magazine’s 2008 Spotlight Award. In its effort to ensure its athletic programs match its academic excellence, Riverview has also been tasked to help SCU renovate locker rooms with state-of-the-art technology. After SCU’s soccer team was awarded a grant to build a new facility for the men’s and women’s soccer teams, which included not only the locker rooms but also the coaches office and lounge areas, Riverview responded by installing a “halo” (circular row) of 5 – 46” NEC LED Monitors where players can watch programs of their choice as they prepare for practice and games. There is also a main 80” monitor, complete with an Extron’s Annotation Technology coupled with Apple TV and iPad telestrator apps for writing notes or illustrating the game strategy. 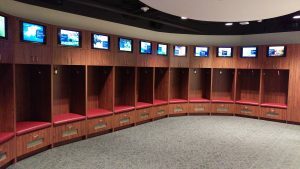 The facility is Wi-Fi/Bluetooth enabled allowing athletes to capture a great moment on their mobile device that can be screened on any of the monitors in the locker room. Riverview was also involved in the recent tech upgrade of the SCU men’s and women’s basketball teams’ locker room facilities, which also feature Live Name Plates (24” monitors) above each locker so player’s names and highlight reels can be looped. 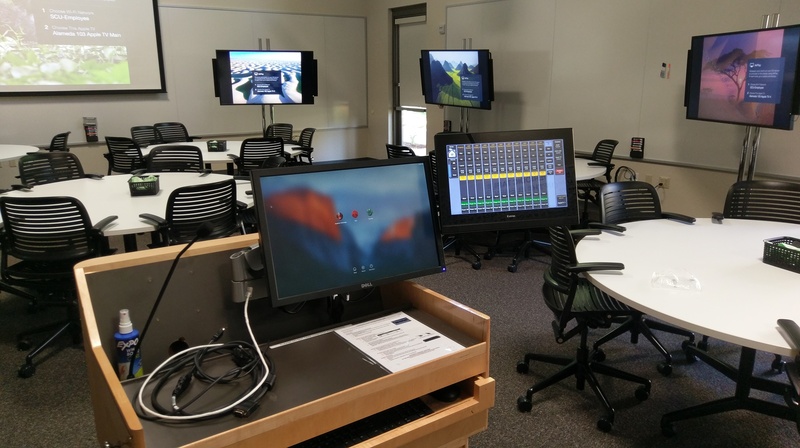 This summer alone, Riverview outfitted 40-plus SCU classrooms and facilities with new Panasonic laser projectors, Extron touch panel control systems, Extron DSP processors, and amplifiers. Some classrooms also received new Sony HD cameras and Shure ceiling microphone systems so students can review classroom activities on laptops, tablets or smartphones. The historic Mission Santa Clara is a consecrated Roman Catholic Church situated on the SCU campus. First established in 1777, the Franciscan Order handed the Mission over to the Jesuits in 1851 who then started Santa Clara College, the first institution of higher education in California. Systems integration work on the Mission Santa Clara de Asis began in 1995 when Riverview implemented an analog audio routing system that was far ahead of its time. Today that spirit of innovation is apparent in their more recent work that features several separate audio zones that digitally route the speakers to different areas of the church depending on the event, including the front of the church, the right or left sides and in-the-round. this year’s commencement speakers, Juan Felipe Herrera, 21st Poet Laureate of the United States and Leon Panetta, former Secretary of Defense. The caliber of speakers the school attracts each year reinforces the need for audiovisual reliability. For psychology students, Riverview outfitted one observation room and three counseling spaces with advanced video and audio recording technology and USB interfaces so students can monitor counseling sessions and even walk away with a recording of sessions for later use. Today, St. Josephs Hall, built in 1911, is where the college president and administrative staff hold regular meetings and conference calls. Riverview most recently installed a 16-channel Shure Axient wireless microphone system to make sure all participants can be heard and content easily recorded and archived. In the SCU Music and Dance Facility (MDF) rehearsal and recital hall, Riverview designed and installed theatre grade lighting, sound and projection to maintain a state-of-the-art performance stage. This recent effort represents the third time Riverview has upgraded this key performance art venue. Named after the former president of Santa Clara University, Fr. Paul L. Locatelli, this multi-purpose space is used for large-scale student events like banquets, dances, concerts, performances, cultural shows and exhibits. Riverview installed a 12,000 Lumen Projection System; 7.1 Meyer Sound Surround System; an Extron Touch Panel Control; laptop, mobile device, and BluRay playback systems; HD lecture and event video capture system; LED theatrical multi-zoned lighting system; 32 Channel Midas mixing console with stage snake Integration for live music performances.